Ubuntu is now an officially support Operating system for ColdFusion 9. 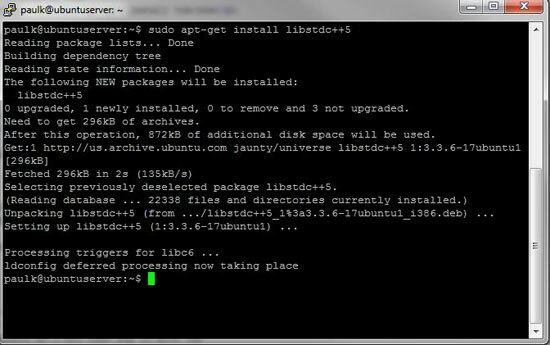 This is a guide on installing Apache and ColdFusion 9 on a clean install of Ubuntu 9.04. This starts with a clean install on Ubuntu 9.04 with no additional options selected during the install. If you are planning on running PHP side by side with ColdFusion my recommendation is to set up PHP first then ColdFusion. Reboot to apply any changes from the upgrade. At this point I switch to a remote ssh client (putty Windows or terminal on OSX). We are now ready to install Apache. At this point you need to download ColdFusion 9. This example is using the 32 bit Linux version. I don't need ftp on this server so I will use scp to move the ColdFusion 9 installer to my home directory. You will need to accept the agreements to continue. I will install the trial (you can put in a serial number at a later time). I will install the standard version with jrun. I will install all the default components. If you do not need a subcomponent opt it out. The standard install path is acceptable. Just press enter. 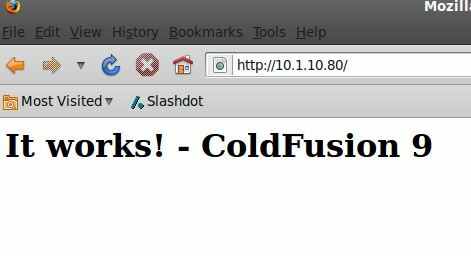 This is a clean server so I do not have any prior versions of ColdFusion to deal with.